Bring blueberries and raspberries to boil in ¼ c apple juice. Allow mixture to simmer until the berries are soft. Add 2 T maple syrup. Add kuzu root to ¼ c chilled apple juice. Stir kuzu-apple juice mixture to berry mixture while simmering to thicken. Starting with cous cous, place a layer in bottom of dish or sundae glass. Then a layer of berry compote. Repeat until parfait is created. Feel free to add additional maple syrup for sweeter taste. You can serve warm or chill for 1-2 hrs. Sharon is a health care administrator and adjunct college instructor with over 30 years of study and practice in plant-based nutrition. She holds a Bachelors in Psychology from Cheyney State University and a Masters in Public Health from the University of Pittsburgh School of Public Health, certified in Plant Based Nutrition by the T. Colin Campbell Center for Nutritional Studies and by the Physicians Committee for Responsible Medicine as a Food for Life Instructor. Sharon is particularly enthused by those committed to empowering their health to experience the aliveness of vibrant health. Her teaching focuses on students empowering themselves. Put dates, pecans and oats in a high-performance blending appliance and process until the mixture forms a dough. If the mixture is still too crumbly to hold together, add more pitted dates, on at a time, until the consistency is doughy. Form the date mixture into a ball and place it in the center of the prepared pie plate. Press the date mixture evenly over the bottom of the plate, pushing it up the sides of the pie plate as you go, to make a crust. To craft a pretty edge to the crust, use your index finger to push the inner edge of the crust out, while pinching the outer edge in with the thumb and index finger of your other hand to make a classic scalloped edge around the pie crust. Put all the filling ingredients in a blender and process until smooth. Pour the filling into the crust and bake for 20 min. Bake the pie for 20 to 30 min more, or until the filling is somewhat firm to touch (the center will be slightly soft). Place the pie on a wire rack to cool completely. Before serving, pipe with whipped “cream” around the perimeter of the pie using a star tip, or simply serve a dollop of the whipped “cream” on the side. Taste and add more maple syrup for greater sweetness. Refrigerate for 2 to 4 hours before serving or up to 24 hrs and serve. If you are serving the pie warm, let it stand at the room temperature for 45 min to 1 hr before serving. If you are serving the pie chilled, cool, then cover it with foil and place it in the refrigerator for 3 to 24 hrs before serving. Left over pie will keep about 2 days. 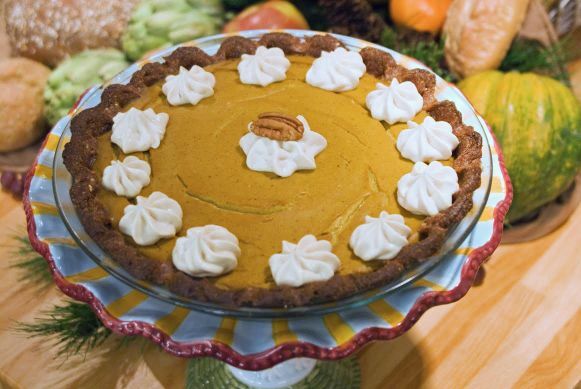 If desired, you may use a rolling pin to roll the dough into a 10” round before placing it in the pie plate. With her love for good food, compassion for animals and enthusiasm for great music, multi-talented author, Laura Theodore, truly is the Jazzy Vegetarian. 1. Preheat the oven to 350° F. Lightly grease preferred deep baking dish. 2. Add the apples and raspberries to your baking dish. 3. In a food processor or blender combine the soaked dates and water along with the banana. Process until relatively smooth, some chunks are okay. 4. Add oats and cinnamon powder to the banana and date mixture. Stir to combine. 5. With wet hands press this sticky mixture on top of the berries and apples. 6. Bake for 30 minutes to 40 minutes. 7. Remove from the oven, transfer to a cooling rack and allow to rest briefly. 8. Serve warm, perhaps with banana nice cream and a fresh berry or chilled. Process according to manufacturer’s instructions until desired texture is achieved. Mix together all ingredients in a heavy saucepan, and bring just to a boil, stirring occasionally. Immediately reduce heat, cover and allow to simmer for approximately 10 minutes, or until the rice is soft and creamy. Remove cover and continue to simmer for 10 more minutes, until apples are just about tender. Turn off heat and allow to rest briefly. Put the dates, raisins, coconut and maple syrup in a high-performance blending appliance and process to the consistency of soft dough. Transfer the date mixture to a medium-sized bowl. Using a cookie scoop, spoon out a heaping T of the date mixture, and roll it into a ball. Continue in this manner to form 10 to 12 truffle balls. Put the cocoa powder in a small bowl. Roll the truffles in the cocoa powder until coated and place on the prepared baking sheet. Store in an airtight container in the refrigerator. Truffles will keep up to 3 days. In a mixer, add your aquafaba and cream of tartar and beat on high for two minutes using the whisk attachment. One T at a time over about five minutes, add the sugar and jam/spread until fluffy incorporated. Add vanilla, beat on high. When all are added, beat for another minute or two until you have one big bowl or two smaller bowls of fluff. 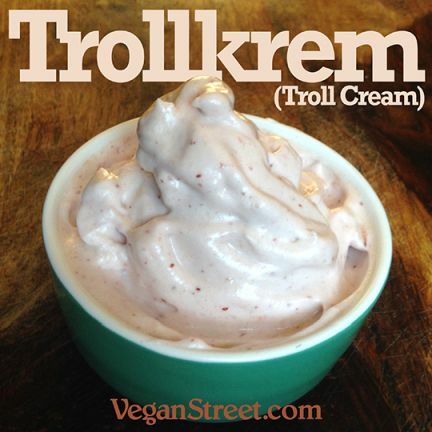 *Trollkrem, literally Troll Cream, a Norwegian mousse-like dessert that somehow is supposed to evoke trolls! Marla Rose and John Beske hatched the idea for the original VeganStreet.com in 1997. Vegan Street conveyed the sense of community and spirit of optimism they felt about compassionate living. Through combining their convictions about veganism with their passions for writing, communications and the arts, they began to carve out their perfect vehicle to express it with -- VeganStreet.com. Add oats, raisins and chocolate chips; stir to combine. Using a cookie scoop or large spoon, dropping a heaping T of the cookie batter onto the lined baking sheet, gently flattening it with a rubber spatula or clean fingertip. Continue this manner with the remaining cooking dough. Transfer the cookies to a wire rack and let cool for 10 minutes. Store in an airtight container in the refrigerator. Cookies will keep for about 3 days. *To make date paste, pit 2 c of dates (any variety), add ¼ c water and microwave 2 minutes or simmer on stove top 5 minutes until re-hydrated & well softened. Blend in a food processor, adding a minimal amount of water only if needed to facilitate creating a puree. Scrape down sides and continue to process until completely smooth and uniform. Combine all ingredients in a food processor, run, scraping down sides. The longer it runs, the smoother, lighter the ganache. Taste to correct for sweetness, spiciness, saltiness as needed. Use immediately or refrigerate for 1 hour for denser texture. If texture becomes too dense, just add a T or 2 of water and reprocess. Add just enough date paste for the walnuts to adhere into a crust. In your tart, tin, lay down plastic wrap, then press enough walnut-date mixture into the contours of your tin to create a base layer. 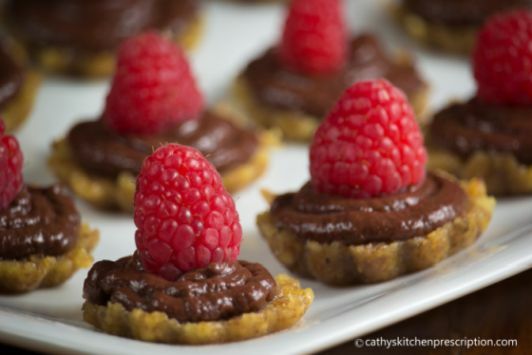 Add ganache by spoon or pastry bag into the tartlet crust. To serve, gently push up bottom on larger tins and pull out by the plastic. For smaller tins, gently pull tartlet out by the plastic lining, place raspberry on each tartlet and plate. More water will create a looser date paste and softer ganache which may be appropriate for parfaits, for example. To pipe decoratively, on the other hand, ganache should be stiff and therefore a dense, stiff date paste is preferable. Take your time with creating a uniform paste for the smoother it is, the silkier the ganache. Date paste freezes well. Ganache will last about a week in the frig. Cathy Katin-Gazzini, a seasoned plant-based nutritional coach and chef, teaches the profound health benefits of plant-based nutrition, without oil, by working with patients to prevent, treat and often reverse their chronic disease conditions through lifestyle counseling, group immersion programs and her empowering cooking classes. Visit Cathy at cathyskitchenprescription.com, https://www.facebook.com/cathyskitchenprescription/, https://twitter.com/CathysKitchenRx and https://www.instagram.com/cathyskitchenprescription. Put the cashews and dates in a bowl, cover with water, and soak for at least 4 hours or overnight. Drain and reserve the soaking liquid. Transfer the cashews and dates to a blender, along with the berries and lemon juice. Puree until smooth and creamy, adding enough of the soaking liquid to make a creamy consistency. Spoon the puree into freezer pop molds, cover, and place craft sticks in the molds. Freeze until firm, about 3 hours. Remove the lid, and gently pull the pops from the molds. Serve immediately or store frozen in zip-top bags. To make vanilla cheesecake pops, leave out the berries and add 2 T more cashews, ¼ c water, and 1 t pure vanilla extract to blender. Removing the pops from the molds can take a little effort and a little patience. The first time I made freezer pops I thought that hot water was the best way to get the pops out of the mold. Instead, I made a mess. Practice patience in the kitchen and teach your kids the same. You will be rewarded with a better treat for your efforts. 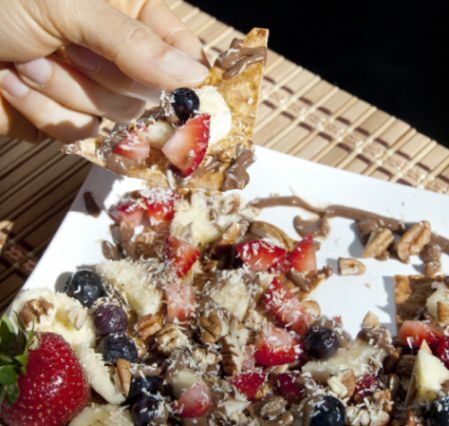 Sugar-free dessert may not taste sweet enough for those first starting to eat a healthier diet. It can take several weeks for your taste buds to down-regulate. If your kids, or you, are not enjoying sugar-free choices like this one, start by replacing half of the dates with an equal amount of maple syrup and then slowly reducing the amount of maple syrup while increasing the amount of dates in subsequent batches. In a large bowl, mix together all dry ingredients: whole wheat flour, baking powder, baking soda, salt, cinnamon, allspice, brown sugar/date paste. 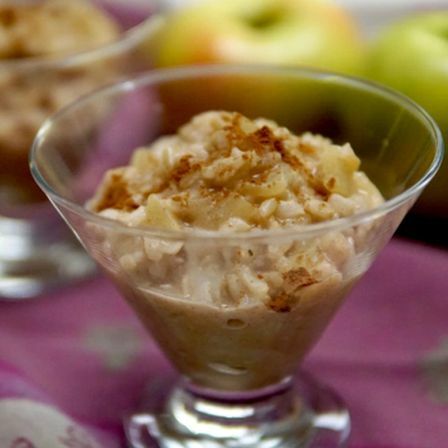 In medium bowl, whisk together applesauce, water, vanilla, vinegar, and brown sugar/date paste. e bowl with dry ingredients. Peel and dice ½ c apples, add to bowl, along with raisins and mix well. Spoon batter into a silicon muffin baking non-stick pan or paper muffin cups. I recommend the silicon pan because these seem to stick to paper cups after baking. Place in oven and bake for 25 minutes. Remove from oven, allow to cool and serve. Remove dates from water and set the water aside. Puree dates in food processor or blender. Add a few T of soaking water to the date puree and continue to blend. Blend until the date paste is creamy. Add more soaking water if needed. Put flax seed, plant milk, water, and dates into a bowl and set aside. Preheat oven to 400° and prepare muffin forms or pan. In a large bowl, add all of the dry ingredients: oat flour, baking powder, and spices. Put the flax-date mixture as well as the applesauce in a blender and create a nice even mix. Pour mixture into your dry ingredients and stir until everything is moistened. Then, fold in the blueberries. Lastly, pour the batter into your muffin cups and bake on 400° for 20 minutes. Remove from oven and let cool before eating. In a large bowl, mash bananas. 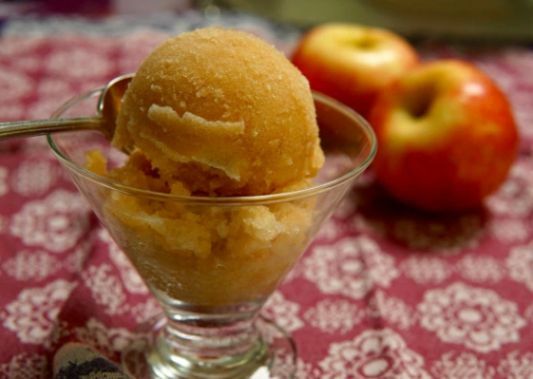 Add applesauce, apple cider vinegar, and vanilla. To the banana mixture, add the oats, ground flax seeds, cinnamon, baking powder, and baking soda. Combine well. Stir in dates, apricots, chocolate chips, and pecans. On parchment-paper lined baking sheet, drop heaping tablespoons of the batter. Bake for 14 minutes. Allow to cool briefly before serving. Line a baking sheet with a silicone baking mat (like Silpat) or with parchment paper. In a double boiler heat the chocolate until just melted. Stir until smooth. Meanwhile, toast the pecans and hazelnuts briefly in a small skillet over medium heat. Don't allow the nuts to burn. Remove from heat. Spread the chocolate evenly on the prepared baking sheet into a 6 x 8-inch rectangle. Sprinkle with the toasted pecans and hazelnuts, and then the apricots and cranberries. Finally sprinkle with the candied ginger. Press ever so lightly to make sure it all touches the chocolate. Allow the bark to sit at room temperature for about an hour, or until firm. Break bark into pieces, and serve. Pre-heat the oven to 350 degrees. Line a muffin pan with Reynolds Stay-brite liners...these work phenomenal and will not stick whatsoever. Paper liners may stick to the muffins. Sift together or use a mesh strainer to combine all the dry ingredients into a medium sized bowl. Whisk very well until thoroughly combined and no lumps remain. Stir in the peppermint candies, if using. In a small coffee mug, combine the milk, apple sauce, almond butter, molasses and vanilla and whisk well. Now whisk in the apple cider vinegar and immediately pour into the dry ingredients. Stir with a spoon just until combined, being careful not to over mix. Carefully spoon the batter into the prepared muffin pan, filling up 10 liners. Bake for 15 minutes, or until a few dry crumbs on a toothpick remain when inserted in the center of a muffin. Bake for 15-20 minutes. Mine took exactly 19 minutes with a few dry crumbs on a toothpick and were perfect. Do not over bake, or they will be dry! Let them cool for 10 minutes and then remove from the pan. It is best to let them cool completely, as they will be tender warm. Sprinkle crushed peppermint on top of the muffins once they have completely cooled. If you don't want to put any peppermint candies in the actual muffins, you can just sprinkle them on top after they have cooled completely after coming out of the oven. I did this with one of the batches and loved it! Just a touch of peppermint! Makes: 8 x 8 pan, 9 large or 16 small brownies. Mix together until you have a smooth, thick batter. Spoon into your prepared pan and top with reserved non-dairy chocolate chips. Bake for 20 minutes. Turn down to 180 degrees and bake for five minutes. Sprinkle the crushed candy canes and bake 10 more minutes. Allow to cool.